Meal preparation shouldn’t be a hassle, especially when you have the best meal prep containers. These containers, which are available in glass and plastic, usually have compartments that can be used for separating different types of food. Think of the traditional Japanese bento boxes but with plastic lids and you get the idea. These containers are useful for many purposes, such as for daily life activities or for special occasions. 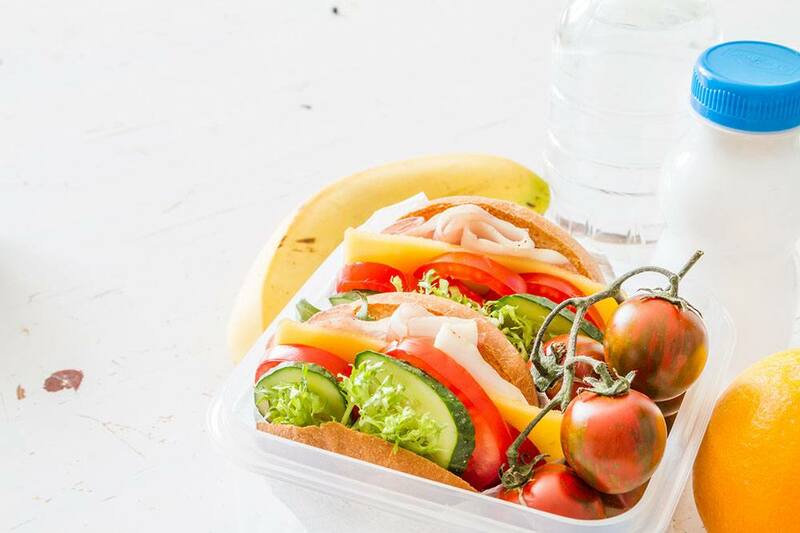 These uses include but aren’t limited to school and office lunches, takeaway food after parties, and even fitness meals for athletes, bodybuilders, and weight watchers. Indeed, these are good investments in kitchenware considering their durability, practicality, and versatility! But not all meal prep containers are up to the task for which they were designed. Keep in mind that these products come with a price, so getting the best value for your money is a must! Be sure to choose the best meal prep containers according to your needs and wants – here’s how. 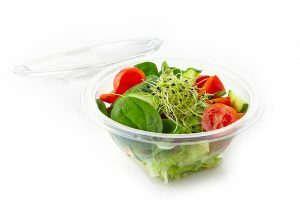 The main containers should be made of durable plastic or glass, as should the plastic lids. If you’re choosing glass containers, you should check that the glass is thick enough to withstand being placed inside a microwave or a freezer. It should also ideally be scratch-resistant and shatter-proof, but be prepared to pay a higher price for these qualities. If you’re choosing plastic containers, your best choices are the ones that are microwave- and freezer-friendly. You can then avoid the hassles of melted or frozen plastic combining with your food. You can also be assured that the freezer-friendly containers preserve the color, texture, and flavors of the stored food. Lean the container on its side to determine if gravity draws out the liquids in it. Look for an effective seal, locking mechanism, and/or suction mechanism that will keep the lid on. Shake the container for 60 seconds or so to determine if the lid stays on. Drop the container from a waist-high height to check if the lid also stays in place. The best lid passes two out of the three tests, especially the first two tests. Glass containers are generally easier to clean than plastic containers. You should consider dishwasher-safe containers no matter their main material for easy reuse. Before looking at meal prep containers, be sure to have a general idea of the size – length, width, and thickness – that you want. You may also measure the cabinets where these will be stored when not in use and the bag where these will be carried for a better choice. You should avoid buying the first set of containers that attracts your attention. The comparison of features is a must when buying products. 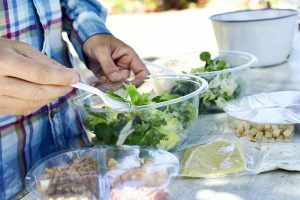 With the abovementioned steps in mind, we have taken the liberty of recommending these five best meal prep containers for your consideration. Bento boxes are such a useful invention that they have been reinterpreted in various ways. Among the best reinterpretation is this set-of-20 3-compartent meal prep containers made from BPA-free plastic. These plastic containers are suitable for school and office lunches, as well as for portion control, meal preparation, and party takeaways. You will definitely find several uses for them. These will likely become indispensable in your kitchen! These meal prep containers are so easy to buy because these are also easy to use and reuse, easy to clean, and easy to fill with food, no matter your preferred uses for them. The durable plastic means that these can be used for a few years with proper care and maintenance. The BPA-free plastic component means that there’s no need to worry about harmful chemicals leaching into your food, even when it’s heated in the microwave. But there are also minor issues that come with these containers. A few customers, for example, complained about one or two cracked lids when they opened the package. Be sure to contact the customer service hotline to have these replaced, if you want it. Yet another modern bento box is the Me.Fan, a set of plastic meal prep containers with lids. The 32-ounce capacity is just the right size for portion control purposes. You will likely be attracted to the set’s overall design. When you look closer at its features, your mind will probably be set that it’s the best of the bunch. The Me.Fan set of containers is a highly satisfactory choice, too. You will appreciate the thick, sturdy, and safe plastic material used, as well as the secure lid, deep and spacious compartments, and ease of cleaning. You can use it for a wide variety of purposes, too, whether at home, in the office, or during parties. If you’re bothered by the slight plastic smell when the containers are removed from the box, you can always wash them first before using. Just place them in the dishwasher or wash them by hand. Meal preparation for you and your family will be easier when you have this set-of-14 lunch box! You can easily place the different food, such as omelets, sliced fruit, and small sandwiches, in the compartments. Your kids can even decide which food goes where in the box. With 14 containers in the set, these can be used for the preparation of a two-week supply of meals. Just store the food in the containers, place them in the freezer, and reheat them in the microwave, when needed. The Tadge Goods meal prep containers are bestsellers because their plastic materials keep the food fresh, as well as preserve its color and texture. Even freshly made guacamole can retain its original color seven days after it was refrigerated while in the container! 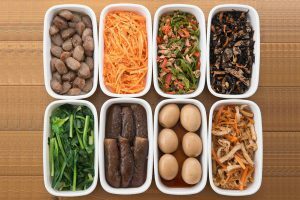 Such convenience means ready-to-eat meals are possible, a convenience when you have an on-the-go lifestyle or you’re on cleansing diet. Many people appreciate the convenience of 21-day portion control containers manufactured by Meal Lab. 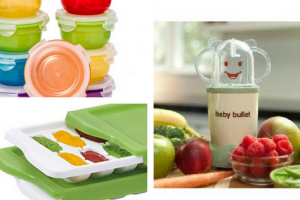 These are even considered the more affordable alternative to Tupperware without sacrificing on the quality of the materials and performance. This set consists of 10-pack bento boxes with each container able to accommodate as much as 32 oz. in food within its three compartments. The Meal Lab apparently takes its name seriously. The plastic material isn’t just safe for use in consumer products, but it also doesn’t absorb the colors, flavors, or oils of the food stored in the container. The portion sizes are just the right size for kids and adults, not to mention that the cavities are deep enough to separate the different types of food. 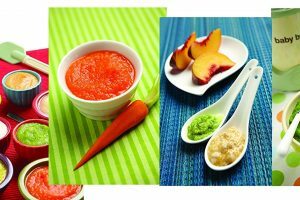 Since these are safe for use in the freezer and microwave, they are great for a wide range of uses. You can use them for preparing boxed lunches for your family, for giving packed meals to charity, for portioning your food as part of a healthy diet plan, and more. You can even use them to give your guests party food! Glass is also a great material for meal prep containers. While the material is usually heavier than plastic, it has several benefits to its merit. The set, by the way, comes with three glass containers with their plastic lids. 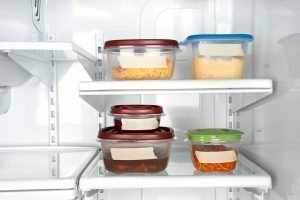 This set of glass meal prep containers may not have the compartments that the four plastic containers have, but it’s a minor issue for most buyers. The more durable, if heavier, glass material is guaranteed to keep the store food fresher longer, as well as to ensure that its flavors are preserved. The containers are also easy to clean by placing them in the dishwasher. Be careful about handling these glass containers, however, because these aren’t as durable as Pyrex glass and the like. If you’re looking for durability, these are significantly better than the cheap glass containers in the market. Just handle them with more care than you would plastic containers. The choice in meal prep containers should be given careful thought. These containers are for food, whether for yourself or for others, so they must meet strict safety requirements. The materials, for one thing, should be free of chemicals that could potentially harm the body, especially when they come into contact with your food. The overall construction should be sturdy and strong enough to hold the contents as well as leak-proof to reduce messy spillages. Of course, the more reusable these containers are, the better for your pockets and the environment. The more uses you can get out of them, the more value for the money you can enjoy, not to mention that you’re sparing the environment more fodder for the landfills. Be sure to look for containers with materials that can withstand repeated freezing, heating, and washing. 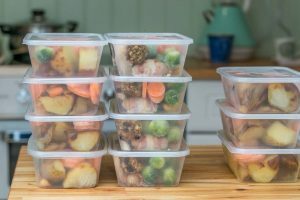 When you have chosen the best meal prep containers for your needs, you will find that these are good investments for your life. You can easily prepare and portion meals for yourself and for others, as well as plan meals in advance for as long as 21 days.